A copy of the four-page advertising section Chinawatch along with a copy of The Des Moines Register in Des Moines, Iowa. As friction between Washington and Beijing has intensified this year over issues including trade and the mass detention of ethnic Uyghurs in Xinjiang, the Chinese government’s propaganda and censorship apparatus has sought to keep pace. During the past month in particular, three existing trends in the Communist Party’s media policy have gained new prominence: a revival of Mao-era themes, suppression of negative content about the economy, and a push to deliver official narratives directly to U.S. audiences. The authorities have also actively intervened in news coverage to suppress any negative reporting on China’s economic situation. On September 11, for example, the popular online portal Netease was forced to suspend updates of its financial news channel. The company announced that it had undergone a profound “self-criticism” and intended to conduct a comprehensive “rectification” of content. In a similar vein, on September 26, the Cyber Administration of China (CAC) imposed a one-month suspension on the technology, news, and financial channels of Phoenix New Media, allegedly because the website and mobile app had violated rules on permissible news sharing. 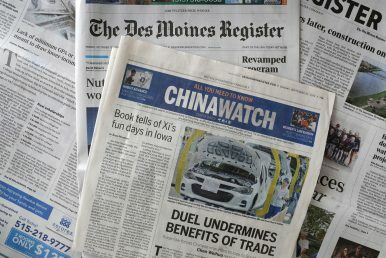 In late September, the print edition of the Des Moines Register, the daily newspaper of Iowa’s capital, included a four-page China Watch supplement, paid for by the state-owned China Daily. Although such supplements have appeared for years in major newspapers like the Washington Post and the Wall Street Journal, this was the first known instance of China Watch appearing in Iowa. Moreover, the content of the propaganda was more targeted and politicized than is typical for China Watch features. For example, rather than touting the Belt and Road infrastructure initiative or the promising investment climate in a Chinese province, two of the front-page articles described how a trade war would harm American soybean farmers and promoted a new book fondly recalling the time Xi had spent in Iowa as a young man. In addition to the supplement, China’s ambassador to the United States gave two high-profile media interviews in the last month that seemed designed to reach left- and right-leaning audiences — one on October 3 with National Public Radio and another on October 12 with Fox News. Financial data extracted by the Center for Responsive Politics from China Daily’s reports to the U.S. Department of Justice under the Foreign Agents Registration Act (FARA) show the scale of Beijing’s propaganda efforts in the country. Since January 2017, the paper’s distribution company has reportedly spent over $15.7 million to influence U.S. policy and public opinion, accounting for almost 60 percent of all spending by FARA registrants from China. In 2017, China Daily was the ninth largest foreign principal in terms of spending and the largest that was not itself a government. Rather than persuading U.S. audiences, the campaign has galvanized fierce criticism from top U.S. officials, including President Donald Trump and Vice President Mike Pence. U.S. Ambassador to China and former Iowa Governor Terry Branstad, who has long been friendly with Xi, appears to have been taken aback by the China Daily content in the Des Moines Register. In a September 30 op-ed in the same paper, he criticized China for “running propaganda ads in our own free press,” while noting that “one of China’s most prominent newspapers dodged the offer to publish” his article in response. The Chinese regime’s media controls have long had a detrimental effect on U.S.-China ties, but as propaganda and censorship continue to escalate, bilateral relations are likely to get even rockier.